Objectives Early goal-directed therapy (EGDT) is recommended for sepsis management in current guidelines, but the underpinning evidence is controversial. Clinician beliefs and the capacity to implement all recommended elements of EGDT in emergency departments (EDs) are uncertain. Our study aimed to explore self-reported management of early sepsis by Scottish emergency medicine (EM) and intensive care medicine (ICM) consultants, delineate important differences and determine the guideline recommendations rated most important and deliverable within the ED. Methods A postal survey using a hypothetical patient with septic shock was sent to all EM and ICM consultants practising in Scotland. Results 67% (76/114) EM and 61% (96/157) ICM consultants responded. Normal saline was preferred by EM respondents (‘always/often used’: EM 86%, ICM 23%, p<0.0001), whereas ICM respondents preferred Hartmann's solution (EM 42%, ICM 72%, p=0.0164), gelofusin (EM 10%, ICM 63%, p<0.0001) and starch (EM 0%, ICM 24%, p<0.0001). More ICM respondents indicated they used central venous pressure and invasive arterial pressure monitoring in the ED, and initiated vasopressors (EM 57%, ICM 90%, p<0.0001). More ICM consultants used specific haemoglobin transfusion triggers (48% EM, 77% ICM, p=0.0002), but marked variation in haemoglobin triggers and targets was reported. Lactate was rated the most important single resuscitation parameter by both specialties; no ED and only two ICM consultants rated ScVO2 most important. Conclusions Differences in early fluid and vasopressor management of sepsis exist between Scottish ICM and EM consultants. Transfusion practice is highly variable, suggesting clinical uncertainty. Lactate is considered more important than ScVO2 measurement. Severe sepsis is a common reason for hospital admission and remains a major cause of worldwide morbidity and mortality.1 ,2 Mortality remains as high as 35% despite advances in treatment.3 Early goal-directed therapy (EGDT) may improve outcomes,4 although this remains controversial. Practice guidelines, most notably from the Surviving Sepsis Campaign (SSC), recommend a ‘bundle’ approach to management to promote consistent delivery of best practice. Following a recent update in 2012,5 SSC bundles relating to the first 6 h of management include serum lactate measurement, blood cultures, early administration of appropriate antibiotics and adequate fluid resuscitation. For septic shock, the early use of vasopressor agents and the measurement of central venous pressure (CVP) and oxygen saturation are recommended, followed by interventions to achieve therapeutic targets. In most healthcare systems, patients with severe sepsis first present to emergency departments (ED). In the UK, the early sepsis bundle has been adopted as a quality indicator by the College of Emergency Medicine,6 but other quality drivers potentially compete with its delivery such as a 4 hour treatment target.7 Understanding factors affecting optimum early sepsis management is relevant, given the known variation in the management of early sepsis8 and ongoing uncertainty regarding EGDT.9 Our aims were to explore how emergency medicine (EM) and intensive care medicine (ICM) consultants approach the early management of sepsis in the ED, to understand which aspects of EGDT they aim to deliver and factors currently limiting this and identify areas of discordance between the specialties in relation to clinical practice. The population of Scotland is 5.2 million. Scotland has a centrally coordinated and funded healthcare system with 23 ICUs joined in a single audit network and 22 adult EDs with EM consultant supervision. There are no private EDs or ICUs. We identified all Scottish EM and ICM consultants from mailing lists provided by the Scottish College of Emergency Medicine and the Scottish Intensive Care Society, supplementing this with local enquiry to minimise omission of any consultants. EM and ICM consultants who only practised in paediatric hospitals, had retired or no longer work in Scotland were excluded. The survey was based on a hypothetical scenario of a septic patient presenting to the ED. The scenario and survey questions were developed through an iterative process among the investigative team adapted from a previous survey undertaken in Canada.10 We aimed to acquire information on specific aspects of resuscitation and initial management, namely, monitoring, fluid administration, use of inotropes and red cell transfusion triggers. The survey was piloted internally among 10 EM consultants and 15 ICM consultants for ease of completion, clarity and content validity. 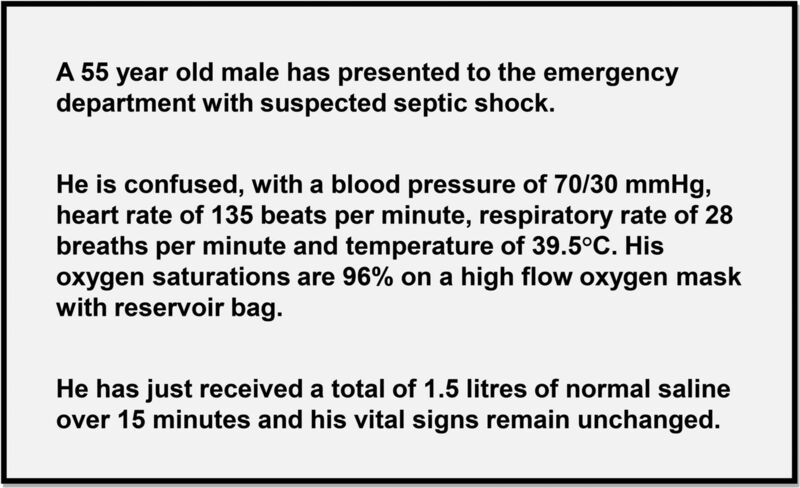 The hypothetical scenario (figure 1) described a 55-year-old man who was febrile, hypotensive and tachycardic after 1.5 L of intravenous fluid resuscitation. The full survey is available in the online supplement. The hypothetical scenario presented within the survey. The survey was posted with a stamped return envelope to all eligible consultants. The first round was posted between November and December 2011. Non-respondents received a second survey mailed between January and February 2012. Respondents were anonymised. Responses to individual questions were either closed yes/no answers or a five-point Likert scale (always, often, sometimes, rarely or never). For analysis, responses on the five-point scale were dichotomised to ‘infrequently’ (sometimes, rarely, never) and ‘frequently’ (often, always). Continuous data are reported as median (quartiles; range) or mean (SD) as appropriate; categorical data as numbers (percentages). Variation between EM and ICM consultants was compared using the χ2 test for dichotomised data and the Mann–Whitney U test for continuous data. The survey responses are displayed in figure 2. The median (range) age of respondents was 46 (34–63). EM respondents were younger (median age 43 (34–63)) compared with ICM respondents (median age 48 (36–63), p=0.0019). EM respondents had practised for less time following completion of training compared with ICM respondents (EM 7 years (IQR 3–18) vs ICM 16 years (IQR 9–23 (p<0.0001)). Respondents from both specialties had similar gender profile (males: EM 52 (76%), ICM 71 (78%) p=0.8497). Table 1 describes responses to questions relating to optimal ED monitoring, routine availability and use. Peripheral oxygen saturations (SpO2), non-invasive blood pressure and urine output measurement were considered routinely available within the ED by both groups. Lactate measurement was considered routinely available by approximately 80% of consultants. Few consultants from either specialty indicated routine availability of central venous oxygenation, pulmonary artery catheterisation or other forms of cardiac output monitoring. Responses indicated that, in an optimum situation, lactate measurement would be used by nearly all respondents from both specialties. A greater proportion of ICM compared with EM respondents used CVP under optimum circumstances (EM 34/73, ICM 67/85; difference 32% (95% CI 17% to 47%), p<0.0001) and invasive arterial pressure measurement (EM 54/73, ICM 80/88; difference 16% (95% CI 5% to 29%), p=0.0055). In response to the question asking which single resuscitation parameter in isolation was considered, the most important lactate was the most highly ranked parameter (figure 3). No EM consultants and only two ICM consultants indicated central venous oxygen saturation as the most important parameter to guide resuscitation. Parameter considered most important in isolation as a marker of adequacy of resuscitation. Figure 4 reports responses relating to fluid administration. Normal saline was the preferred crystalloid for more EM consultants (EM 63/73 vs ICM 18/78, difference 63% (95% CI 52% to 83%), p<0.0001), while Hartmann's solution was preferred by ICM consultants (EM 31/69 vs ICM 60/83, difference 27% (95% CI 4% to 34%), p<0.0164). The use of colloid solutions was more prevalent among ICM consultants, with gelofusin being the preferred colloid (EM 7/71 vs ICM 53/84, difference 53% (95% CI 38% to 69%), p<0.0001). Starch solutions were used by some ICM but no EM consultants (EM 0/67 vs ICM 18/75, difference 24% (95% CI 14% to 34%), p<0.0001). Responses suggested albumin solutions were used rarely by either specialty. ICM consultants were more likely to start vasopressors in the ED (EM 41/72 vs ICM 77/86, difference 33% (95% CI 19% to 46%), p<0.0001). Virtually all consultants indicated they would always or often use noradrenaline (norepinephrine) (EM n=37/70 (53%), ICM 89/89 (100%)) or adrenaline (epinephrine) (EM n=18/70 (26%), ICM 16/84 (19%)). Other vasoactive agents (dopamine, vasopressin, phenylephrine and metaraminol) were used always or often by very few consultants (less than 5%) from both specialties. More ICM consultants use a specific transfusion trigger in the management of a septic patient (EM 30/63 vs ICM 68/88, difference 30% (95% CI 14% to 45%), p=0.0002). However, the specific transfusion trigger and target haemoglobin (Hb) concentrations varied widely within both groups for both ScVO2 scenarios (figure 5). 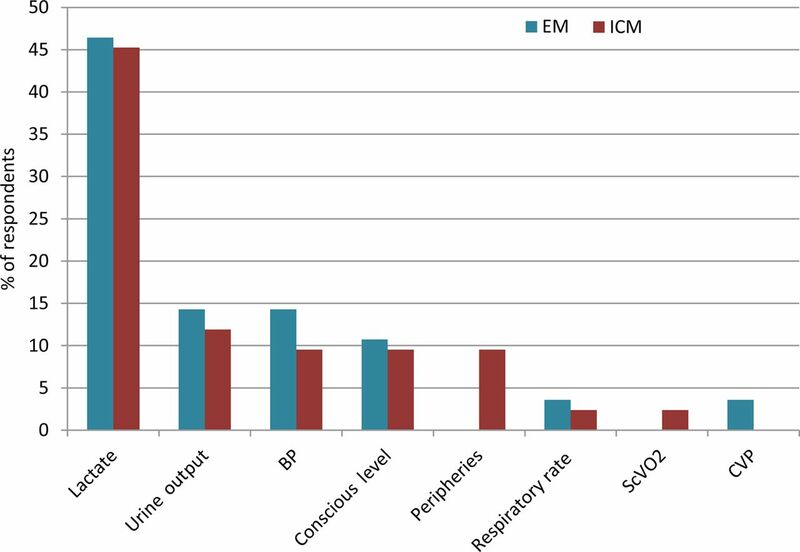 Transfusion triggers and targets used by intensive care medicine (ICM) and emergency medicine (EM) consultants with different ScVO2 values. When ScVO2 was <70%, responses ranged between <70 and 100 g/L among consultants from both specialties. Overall, mean Hb transfusion triggers were similar (EM 81.0 g/L (SD 13.6); ICM 82.6 g/L (SD 10.8), p=0.60). When ScVO2 was >70%, there was also wide variation in responses: ICM consultants indicated a trend towards using slightly higher Hb triggers although this difference was not statistically significant (EM 71.3 g/L (SD 12.4); ICM 75.3 g/L (SD 10.3), p=0.07). Responses to the Hb concentration used as a transfusion target rather than as a trigger indicated variation between 80 and >100 g/L for both groups when ScVO2 was <70%, with similar mean values for both specialties (EM 93.6 g/L (SD 9.7); ICM 92.4 g/L (SD 10.06), p=0.51). When ScVO2 was >70%, responses differed, with EM consultants using higher target Hb concentrations as a transfusion target (EM 92.5 g/L ± 9.3, ICM 86.0 g/L ± 9.5, p=0.0005). Over 90% of both EM and ICM consultants reported that measuring lactate, taking blood cultures, delivering antibiotics, fluids and vasopressors, and measuring CVP were considered routinely deliverable within the ED. The ED initiation of vasopressors was thought achievable by less respondents (EM n=56 (77%) vs ICM n=67 (74%)) and fewer felt able to achieve the measurement and maintenance of CVP (EM n=39 (53%) vs ICM n=47 (52%)). The measurement and targeting of ScVO2 was considered deliverable by a minority of both groups (EM n=16 (22%), ICM n=26 (29%)). In response to questions concerning factors that influenced their ability to accomplish the goals of the SSC within the ED, more EM consultants (n=37, 51%) indicated department workload was important compared with only 17 (19%) of ICM consultants. Early transfer to critical care was the most frequently reported reason for not delivering early sepsis management in the ED (EM n=24 (33%) vs ICM n=33 (37%)). Both specialties also cited a lack of nursing staff (EM n=19 (27%) vs ICM n=11 (12%)) and lack of medical staff (EM n=16 (23%) vs ICM n=15 (16%)) as reasons. The 4 hour target was felt to be always or often important by a minority of consultants (ED 21%; ICM 18%). A lack of suitable equipment and management being outside the scope of normal ED practice was not considered important by either specialty. This national survey has revealed a number of important differences between EM and ICM specialists in their delivery of early sepsis management in Scottish EDs. Specifically, there were marked specialty differences in the use of CVP monitoring, vasopressors, red cell transfusion and the choice of intravenous fluids. ScVO2 monitoring was not considered feasible or part of optimum management by the majority of consultants. While there was concordance between the specialties for most monitoring techniques used under optimum conditions, significantly more ICM respondents used CVP measurement. Few respondents from either specialty indicated ScVO2 measurement was part of their optimum management despite current international recommendations. Almost all respondents indicated that lactate measurement was part of their optimum management, and out of all parameters, lactate was considered by the largest number of consultants to be the most important marker in determining the adequacy of resuscitation. Lactate clearance may be non-inferior to ScVO2 measurement in guiding resuscitation,11 and this may partly explain its importance. A striking observation was that although lactate measurement is a requirement within College of Emergency Medicine sepsis standards,7 only 80% of responders stated the ability to measure lactate within their ED. Significantly more ICM than EM respondents would initiate vasopressor therapy in the ED. This is consistent with recent data from the Scottish Trauma Audit Group showing low vasopressor use in patients unresponsive to fluids in Scottish EDs,17 and a previous survey that found reluctance among Scottish EM trainees in initiating vasopressor therapy.18 The reasons for this difference are unclear. Possible explanations are the preference for early central venous access among ICM consultants, together with greater familiarity with vasopressor use. ICM respondents were older, with significantly more time spent as a consultant, and this may account for some of the variations in management between specialties found in this survey. Responses to questions relating to the use of blood transfusion were of particular interest. Our survey suggested marked variation in practice within both specialties. ICM consultants were more likely to use a specific Hb concentration as a transfusion trigger. However, the trigger used varied widely irrespective of whether ScVO2 was less or greater than 70%. 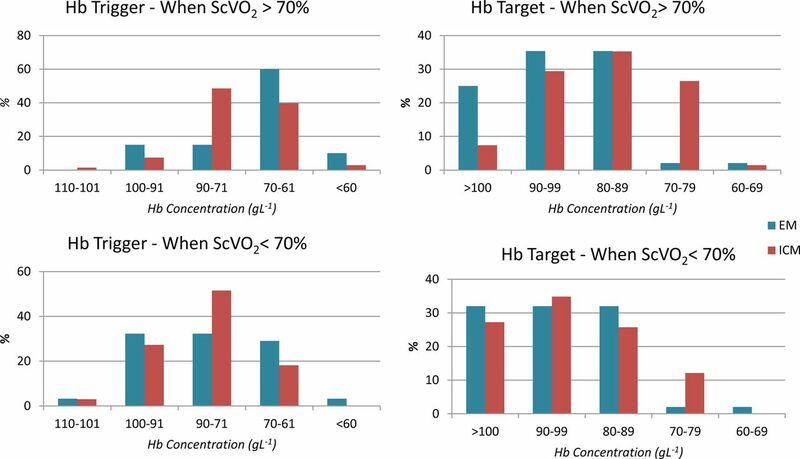 In general, ICM consultants indicated they aimed for a higher target Hb concentration when ScVO2 was <70%, but there was wide variation in Hb targets. In the original EGDT trial by Rivers et al,4 blood transfusion was used in the intervention group when ScVO2 was <70% to maintain a haematocrit (HCT) above 30%, corresponding to a Hb concentration of 95–100 g/L. Sepsis and transfusion guidelines recommend considering transfusion to these Hb or HCT levels when ScVO2 is <70% or there is evidence of inadequate oxygen delivery.5 ,19 Responses to our survey suggest wide variation in practice and interpretation of current evidence. Of concern, consultants from both specialties appeared to believe current evidence supports a target Hb concentration of greater than 90 g/L when ScVO2 was >70%, which is not consistent with current guidelines.20 The variation in practice suggested by these data supports the need for further high-quality evidence and educational initiatives to improve knowledge of current guidance. This study has a number of strengths and weaknesses. We rigorously identified all practising Scottish EM and ICM consultants, used methods to maximise the survey return rate and achieved an acceptable 64% response rate. This suggests the internal validity of our data is high, and it is likely to be representative of Scottish and other UK practice. Our survey was adapted from a similar Canadian survey, modified to reflect new evidence and controversial areas of management, and piloted for face validity before distribution. Weaknesses include issues that apply to all surveys, namely, responses may not represent actual practice and the hypothetical scenario was limited by the clinical detail that could be included. Our survey was conducted in Scotland, and the results may be different in other healthcare systems. This study has found significant variation in the reported early management of sepsis between EM and ICM consultants. Responses suggested differences in fluid choice, with EM consultants using normal saline in comparison to higher use of balanced solutions and colloids by ICM consultants. There was also particularly wide variation relating to the use of blood transfusion within both groups irrespective of the central venous saturation, indicating significant clinical uncertainty in this area and the need for further high-quality evidence. This survey also found that both EM and ICM consultants perceive barriers to implementing aspects of the early sepsis bundle in EDs in Scotland, especially the measurement of ScVO2. Three large ongoing international RCTs of EGDT in early sepsis may provide additional data to guide future practice (PRoMISE, ARISE, ProCESS)22–24 together with a trial of liberal versus restrictive transfusion triggers in septic patients (TRISS).25 The results of these trials may guide greater consistency of approach to the resuscitation of early sepsis in the ED than that demonstrated in responses to this survey study.
. The epidemiology of severe sepsis in England, Wales and Northern Ireland, 1996 to 2004: secondary analysis of a high quality clinical database, the ICNARC Case Mix Programme Database. Crit Care 2006;10:R42.
. Sepsis in European intensive care units: results of the SOAP study. Crit Care Med 2006;34:344–53. Rivers E, Nguyen B, Havstad S, et al. Early goal-directed therapy in the treatment of severe sepsis and septic shock. N Engl J Med 2001;345:1368–77.
. Surviving sepsis campaign: international guidelines for management of severe sepsis and septic shock: 2012. Crit Care Med 2013;41:580–637. College of Emergency Medicine: Standards in Sepsis Management. 2009. http://www.collemergencymed.ac.uk/Shop-floor/Clinical%20Standards/Sepsis/ (accessed 10 Sep 2012). Department of Health. The NHS Plan. 2000 http://www.dh.gov.uk/en/Publicationsandstatistics/Publications/PublicationsPolicyandGuidance/DH_4002960 (accessed 10 Sep 2012).
. Surviving sepsis: going beyond the guidelines. Ann Intensive Care 2011;7:17–22.
. 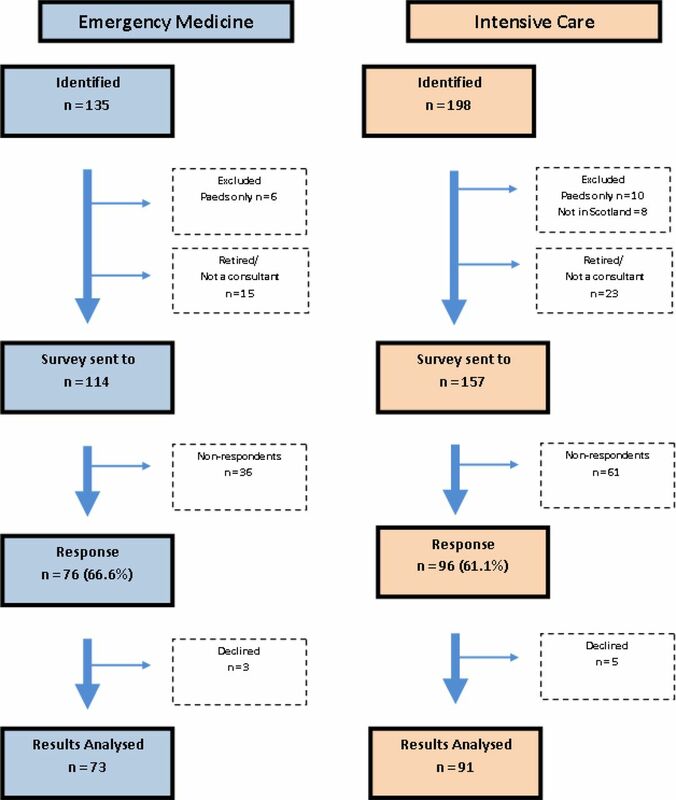 Early goal-directed therapy in severe sepsis and septic shock revisited: concepts, controversies, and contemporary findings. Chest 2006;130:1579–95.
. A survey of Canadian intensivists’ resuscitation practices in early septic shock. Crit Care 2007;11:R74.
. Lactate clearance vs central venous oxygen saturation as goals of early sepsis therapy: a randomized clinical trial. JAMA 2010;303:739–46.
. Hydroxyethyl starch 130/0.42 versus Ringer's acetate in severe sepsis. N Engl J Med 2012;367:124–34.
. Hydroxyethyl starch or saline for fluid resuscitation in intensive care. N Engl J Med 2012;367:1901–11.
. Use of goal-directed therapy for severe sepsis shock in academic emergency departments. Crit Care Med 2005;33:1888–9.
. CRYCO Study Group: preferred plasma volume expanders for critically ill patients: results of an international survey. Intensive Care Med 2004;30:2222–9.
. Association between a chloride-liberal vs chloride-restrictive intravenous fluid administration strategy and kidney injury in critically ill adults. JAMA 2012;308:1566–72.
. The epidemiology of adults with severe sepsis and septic shock in Scottish emergency departments. Emerg Med J 2013;30:397–401.
. Early goal directed therapy: can the emergency department deliver? Emerg Med J 2010;27:355–8. British Committee for Standards in Haematology. Guidelines on the management of anaemia and red cell transfusion in adult critically ill patients. 2012. http://www.bcshguidelines.com/documents/BCSH_Critical_Care_Guidelines_Final_Version_16_11_12.pdf (accessed 10 Sep 2012).
. A multicenter, randomized, controlled clinical trial of transfusion requirements in critical care. N Engl J Med 1999;340:409–17.
. Variability in management of early severe sepsis. Emerg Med J 2010;27:110–15. Protocolised Management in Sepsis Trial (PROMISE). https://www.icnarc.org/documents/ProMISe%20summary_V9.pdf (accessed 10 Sep 2012). Australian Resuscitation In Sepsis Evaluation (ARISE) Trial. http://www.anzicrc.monash.org/arise-rct.html (accessed 10 Sep 2012). Protocolised Care for Early Septic Shock (ProCESS) trial. https://crisma.upmc.com/processtrial/info2.asp (accessed 10 Sep 2012). Transfusion Requirements in Septic Shock (TRISS). http://www.clinicaltrials.gov/ct2/show/NCT01485315 (accessed 10 Sep 2012). Contributors ZJ and SB carried out the data collection and performed the analyses. ZJ, SB, LAM, AG and TSW contributed to the planning and design of the survey and study, and drafted and approved the final manuscript. ZJ and SB are responsible as guarantors for the overall content of the paper. Funding Funded in part by the Edinburgh Critical Care Research Group endowment fund. Ethics approval The South East Scotland Research Ethics Service was approached, but waived the need for formal approval or individual participant consent. Data sharing statement All original data can be made available to individuals in response to appropriate requests to the corresponding author.